David Boocock harvested this 10-point, 181-pound buck within three years of completing habitat improvements to his Montgomery property with a state wildlife biologist. When David Boocock of Montgomery enrolled in a program with the state to improve his land for wildlife, he was hoping the enhancements would boost his odds during the fall deer hunting season. But he never realized that the payoff would come so quickly, or be so impressive. 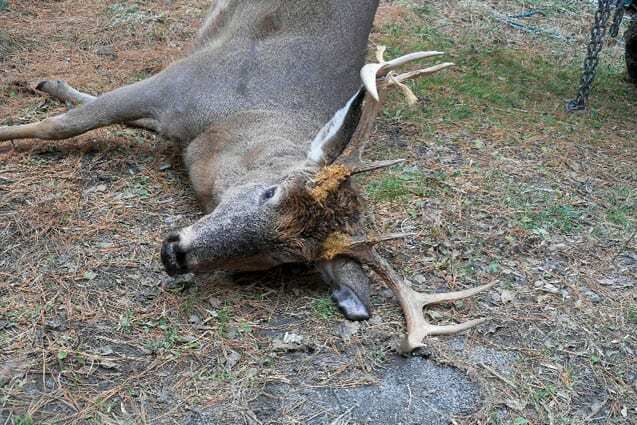 Three years after he completed a habitat management program with Vermont Fish & Wildlife biologist Dave Adams, Boocock got a 10-point, 181-pound buck on his land. The buck was taken under the same wild apple trees that Boocock and Adams had worked to recover as part of the larger habitat improvement plan for his property. The deer was the largest Boocock has ever harvested, and he attributes his success directly to the habitat improvements. Adams says that landowners interested in doing similar habitat management work on their land should contact him about signing up for the Environmental Quality Incentives Program. The program covers a wide range of habitat work, from managing forests for game populations to restoring fields and wetlands for songbirds. It is funded through the U.S.D.A.’s Natural Resources Conservation Service. Depending on the goals of the landowner, biologists may suggest cutting sections of forest to promote habitat for game species like grouse, woodcock, and deer. They can develop a plan to improve old forest roads to reduce erosion and water pollution, or create habitat for songbirds such as warblers. “This program is a great chance for landowners to manage their lands for wildlife. We can help you create a legacy of conservation on your property that will live on for generations,” said Adams. Interested landowners can contact Adams directly at dave.adams@vermont.gov or at (802)-324-6529.